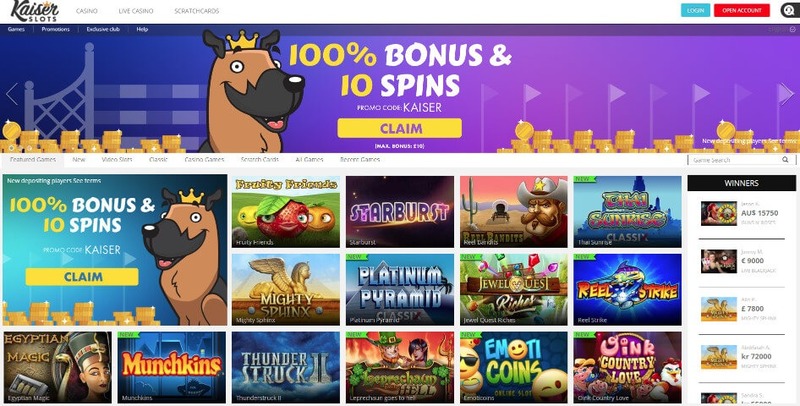 Launched in May 2017 this casino is barely 6 months old and for a new casino, Kaiser Slots isn’t bad, but we feel it has a lot to work and improve on to make it stand out from the rest. Kaiser slots have a great site with some exclusive games. Promotions are also very good even though the wagering can be quite high. What lets Kaiser Slots down is that their customer service isn’t 24/7 – that might change as they grow. Wagering is high on some promotion so watch out for that. if you’re a small time player then we recommend this site. However if you want a loyal program to jon as well, then we suggest you think about it. As the the loyalty program requires heavy deposited game play. Manned by a cartoon dog with a crown, Kaiser Slots bounded onto the scene in 2017 to great acclaim. This casino site has been treating their players to the very latest innovations in gaming, spoiling them rotten with all of the newest games. In our Kaiser Slots review, we’ve been taking everything into account about this site to assess its pros and cons. Kaiser Slots is operated by Aspire Global International LTD and based in Malta. They are licensed under the Malta Gambling Authority. 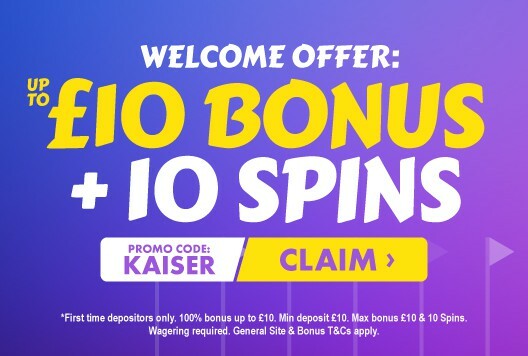 In terms of promotions, there is a small £10 bonus and 10 free spins promotion – which is worth taking to test out this casino. The loyalty program is big but very hard to progress in (if you’re a small-time player). Everything from games to banking is on point and is on the better site compared to most casinos. You’ll definitely get a warm welcome when you start playing with Kaiser Slots. They offer their new players a cash match of 100% and they’ll even add 10 free spins for you to play with too. Just use the code KAISER on your first deposit to qualify for this offer. There’s no second or third deposit offer to enjoy, which may be something that could be added to this site. The 10 free spins that are part of the welcome bonus are awarded on the popular Starburst slot game. The 10% matched bonus is up to £10, meaning deposit just the maximum of £10 and get £20 to play with. There is a loyalty scheme in place, as well as a regular cash back offers, however, so you’re never short of a freebie or two. It’s a clever idea to keep an eye out for special offers from the site, you’ll get these delivered to your email address. The VIP program comes with tonnes of bonus offers and gifts. 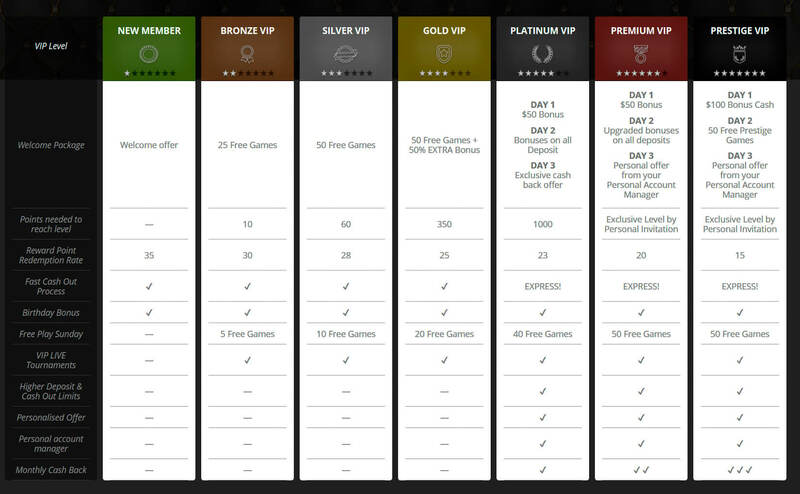 There are seven levels of the VIP program starting from” New Member” to “Prestige VIP”. The VIP program works like this, you can earn 1 Reward Pint for every £40 wagered on most games. You are automatically enrolled into the program and are moved up levels automatically. Premium and Prestige VIP levels are by invitation only. Each VIP level has its own threshold rate (known as Reward Point Redemption Rate) which must be met before you can exchange your points for bonuses. You can view your VIP progress by clicking on “My Rewards” within the “My Account” page. The table below outlines in more detail each VIP level benefit and “Redemption Rate”. Kaiser slots offers a top class mobile experience to their mobile users, with over 400 games available. The mobile site is extremely easy to use and is available through the mobile device’s web browser. There currently is no dedicated android or iOS app available. There are more than 400 games for users to pick from with Kaiser Slots and they’re constantly adding new ones. If you check out the new section of their lobby, you will find a laundry list of all the latest games to join the market. It’s one of the top places to play if you like to try out the games that everyone is talking about. Software from this site comes from the likes of Microgaming, Thunderkick, NetEnt and others. It’s a really diverse gaming lobby, with everything from fruit machines to the most modern games. There are also casino games to dive right in with, though there are a lot more slots than there are casino games. For those that want a speedy win, there are some online scratch cards to play on too. These take just seconds to play and can reward you with a jackpot before you know it. All in all, the games lobby here is really impressive and considering that they’re always adding more it’s just getting even bigger and better. Live chat, email and phone are the ways to get in touch with the customer support team, there is also an FAQ section on the site for those basic questions. There’s a massive FAQ guide here that you can use to learn pretty much everything you need to know about this site. If you’d like any further help with the site, then you can get in touch with the customer support agents. They’re available from 6am to 11pm on a daily basis, just navigate to the bottom of the page and click “contact us”. A pop up will appear with options to follow. Kaiser slots offers a wide range of deposit and withdrawal options as well as fast pay-outs. They really do put a lot of emphasis and effort into their banking options and deposit and withdrawal processes. Making a deposit is easy, simply lick on the “cashier” button on your dashboard, click “deposit”, select the option you want and complete the form. Kasier slots has a fast withdrawal process, withdrawals can be made easily by the “cashier” page within your dashboard. Click “Cash Out”, select the method you wish to withdraw with and complete the form to make the withdrawal. It’s important to know that multiple withdrawals on the same day may be combined into one large payment. Withdrawal requests are processed within 2 business days from the date of request. Withdrawals made by NETELLER, PayPal and Skrill will appear as “Kaiser Slots” within your statement. All other options will show as “Aspire Global International LTD”. Below you will find withdrawal time for each method. With an array of treats up for grabs for players, Kaiser Slots really does pull out all of the stops. There could be some additions to the site, such as a round the clock help team, but overall they’re creating a brilliant place for their players. This site wants to treat every player well and on their own terms, just take a look around and you’ll see that this is very much the case.